Plant tissues. Sclerenchyma, sclereids. Atlas of plant and animal tissues. 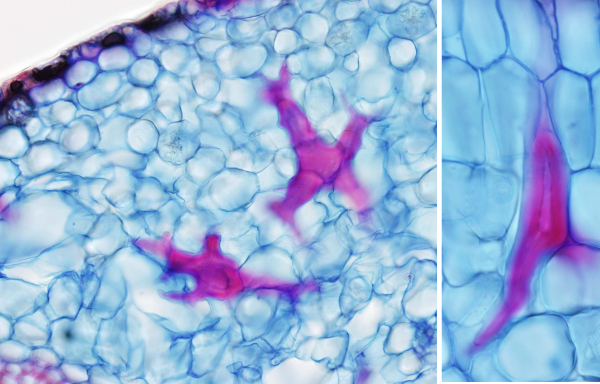 Technique: vibratome sections stained with Alcian blue / safranin. Like other sclereids, astrosclereids usually are found scattered in other tissues. In this figure astrosclereids are dispersed among photosynthetic parenchyma cells of a leaf. They show a star-shape and an extremely thick secondary cell wall, which leaves a very narrow intracellular space (see image on the right).